After an exciting day in the United Kingdom, Elyx moved on and arrived in Geneva, Switzerland. The digital ambassador is excited to get to know the diverse activities of the large United Nations family based in Geneva that includes UNHCR, UNHCHR, OCHA, WHO and many more. 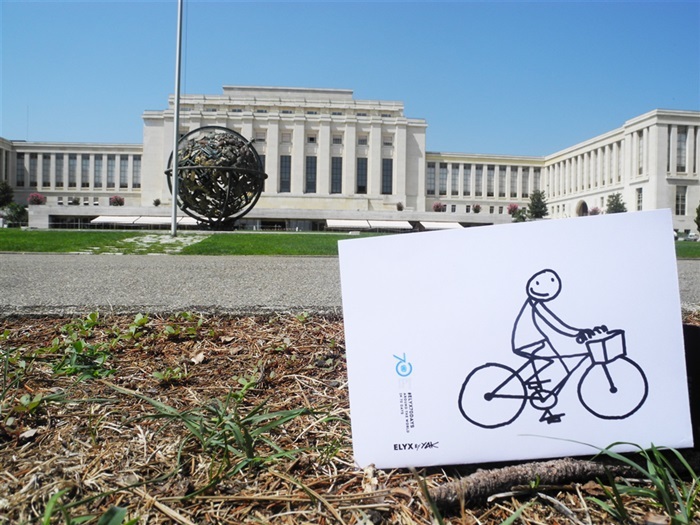 Elyx is welcomed in front of the impressive Palais des Nations by colleagues of the United Nations Information Service (UNIS). First, they invite the digital ambassador on a tour inside the Palace to discover its “treasures”. Elyx learns that the original Palais was built for the League of Nations – the forerunner of the United Nations – in the 1930s, while an extension was opened in 1973. Many of the rooms have been decorated and furnished by gifts from Member States to either the League of Nations or the United Nations. Elyx is especially fascinated by a gift from Spain – the decoration of the ceiling of the Human Rights and Alliance of Civilizations Room. Elyx cycles past the Celestial Sphere. It was gifted by the United States in 1939, via the Woodrow Wilson Foundation (Photo credit: UNIS/ Manuela Altomonte). The United Nations Human Rights Council holds its sessions in this impressive setting. 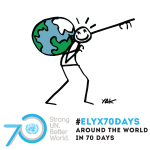 Elyx learns that the body is responsible for strengthening the promotion and protection of human rights around the globe and for addressing situations of human rights violations. 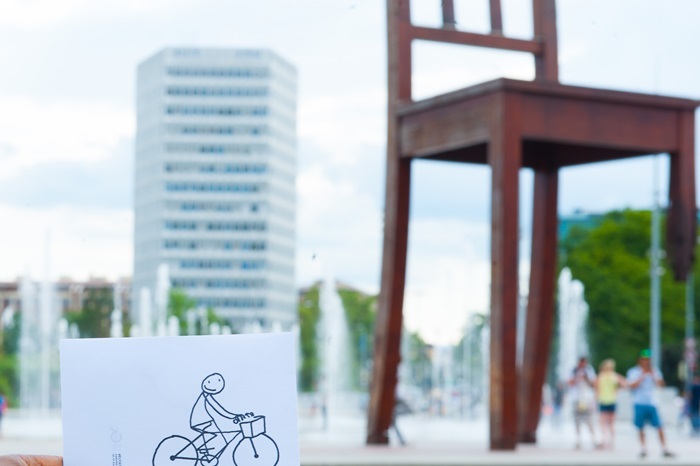 A cycling tour through the Ariana Park follows the exciting tour of the Palais des Nations. With all the sculptures and monuments the 35-hectare park that surrounds the Palais is also a museum in itself. 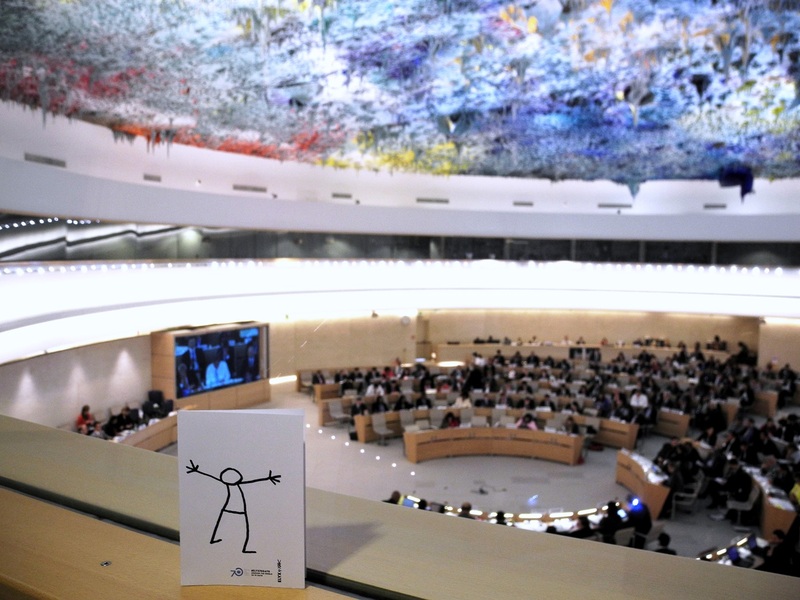 Elyx sees for example the Celestial Sphere – the symbol of the UN Office at Geneva – and the Conquest of Space monument. The digital ambassador also enjoys the diversity of trees in the park. As an arboretum, it has more than 600 different species of trees. Suddenly, Elyx sees something strange: A car that parks without a driver. Colleagues from the United Nations Economic Commission for Europe (UNECE) explain that it is a demonstration. The vehicle’s automated parking system allows the driver to be outside the car during the parking manoeuvre and control the car’s motion via a smartphone or a smart key. Elyx learns that experts are currently discussing the technical boundaries to ensure that the benefits of these new technologies can be captured without compromising on safety. Next, Elyx has an appointment with colleagues from the International Telecommunication Union (ITU). On the way Elyx cycles past the famous Broken Chair Sculpture which is dedicated to landmine victims. Here the digital ambassador learns that ITU is the oldest of the UN agencies because states first established international organizations to cooperate on specific matters. Elyx is delighted to hear that ITU is also celebrating a big anniversary this year. ITU was founded 150 years ago as the International Telegraph Union. 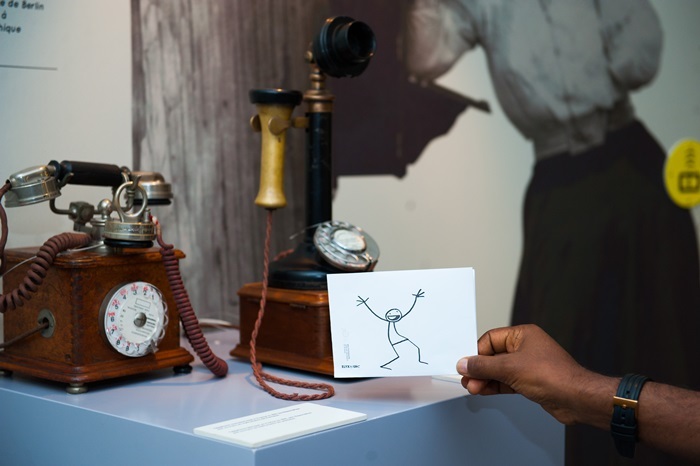 Elyx discovers early models of the telephone in ITU’s own museum, the ICT Discovery museum (Photo credit: ITU). Elyx is excited to hear that ITU has its own museum in its headquarters, the ICT Discovery museum. There the digital ambassador learns that ICT stands for information and communication technology and discovers what it is all about. Feeling like a time traveller, Elyx journeys from the past to the present when visiting all the exhibits. But Elyx not only learns about the evolution of ICT but also about its future. 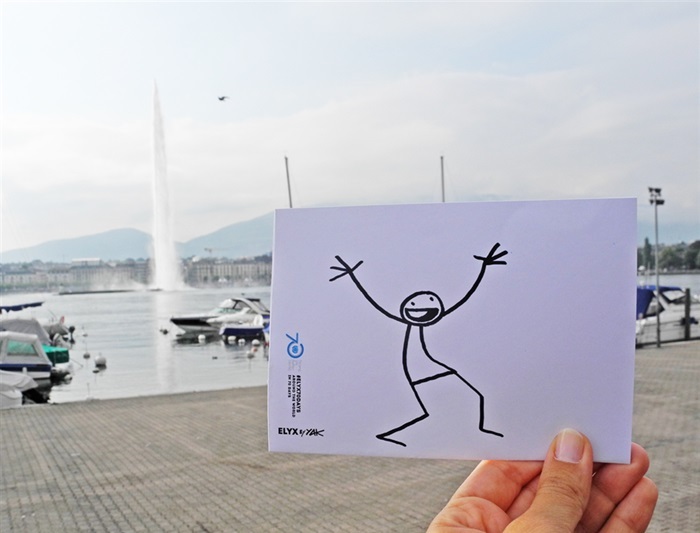 Elyx stops at the Jet d’Eau, a Geneva landmark (Photo credit: UNIS/ Manuela Altomonte). After Elyx left the telecommunication world, the digital ambassador moves on to a Geneva landmark, the Jet d’Eau. Elyx is impressed by the fountain that is one of the largest in the world. The digital ambassador is glad to hear that the Jet d’Eau will be lit blue on 24th October, as more than 160 other iconic landmarks worldwide to “Turn the World UN Blue” on UN Day. Elyx hangs out at the Allèe des Nations, the main entrance into the Palais lined with the Member States flags (Photo credit: UNIS/ Manuela Altomonte). After a packed day, Elyx is exhausted but happy. 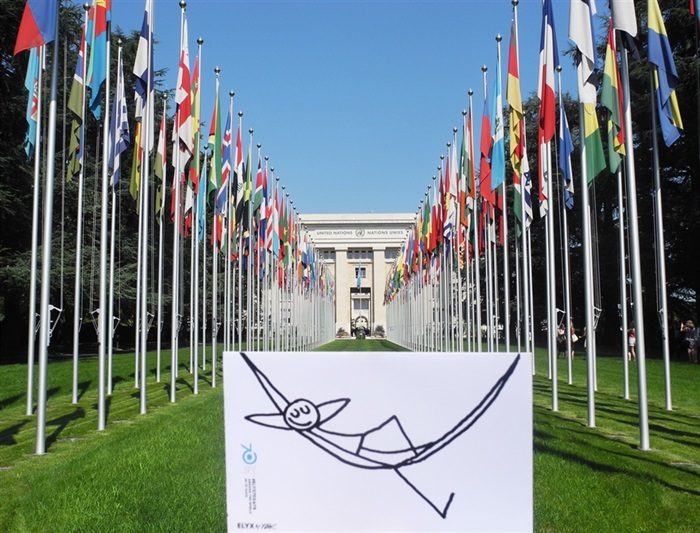 The digital ambassador returns to the Palais des Nations to relax a bit before Elyx sets out for Italy.